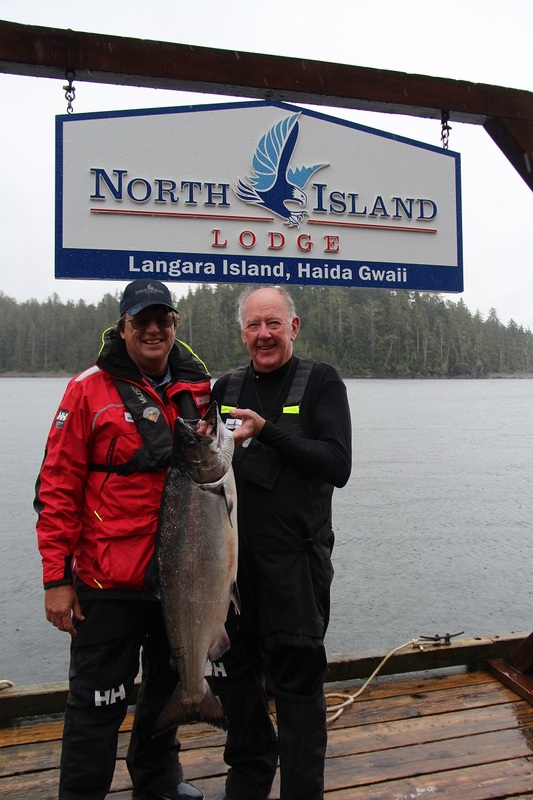 Warm greetings friends from the comforts of North Island Lodge in supernatural Haida Gwaii, where another indescribable season of fishing is in full swing. Sadly for your agent, however, it also marks an ending – the end of my efforts to master the art and science of self-guided fishing. I’m fired. * Barely a ripple on the water. Fired by me that is. There is simply no point in fooling myself any longer. I am never going to know as much as even the most junior guides of The West Coast Fishing Club. They are that good, and I am…not. There was a time when I thought I could match the end-of-day results of a guided boat, and I still believe that is true, but alas, only on the not-at-all-unusual days when the fishing is so good you can’t get a second line down before the first one goes off. But when the going gets a bit more challenging, that’s when it’s no longer time to fish on your own, or even cut bait for that matter. Best to seek the guidance of experts. It’s akin to managing your own investment portfolio in a bull market; you think you’re a genius when the index is soaring, but not so much when those nasty bears come out to play. * Greg Cosway with an aggressive 16lber caught in Bruin Bay. You see friends, the fishing on this first trip of the season has been a little slower than what we typically see in early June. It’s by no means catastrophic, however, as evidenced by the results of the SNC Derby that wrapped up last night over at The Clubhouse, where the top three fish were all Tyees. But there is no question that the guided boats here at North Island Lodge are outperforming us selfies, and in my case by a substantial margin. 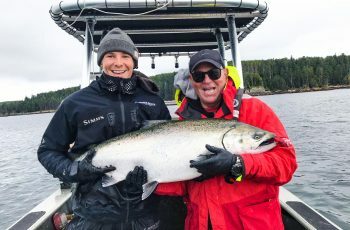 Enter Todd McIntyre, the amiable lodge manager who has 15 years of guiding experience in these waters and is among the best in the world at his craft. Todd was kind enough to steal away for three hours yesterday to help me and my step-son Chris Gordon increase our productivity. * Clubhouse Guide Jared getting one in the bag for Joe Sinclair & Joe Macdonald. “Ya just gotta believe man!” said Todd with a smile as we pulled up at Gunia for a schooling in Salmon fishing. First thing we noticed is how much ground Todd would cover in the search for silver. After just a few fruitless passes, we blasted up to McPherson Point and within minutes had a double-header. Both Chris and I were amazed at how precisely and efficiently Todd worked a very small area of water where he knew every rock, where the current was too strong for lazy lunkers and where the stiller waters held more promise. 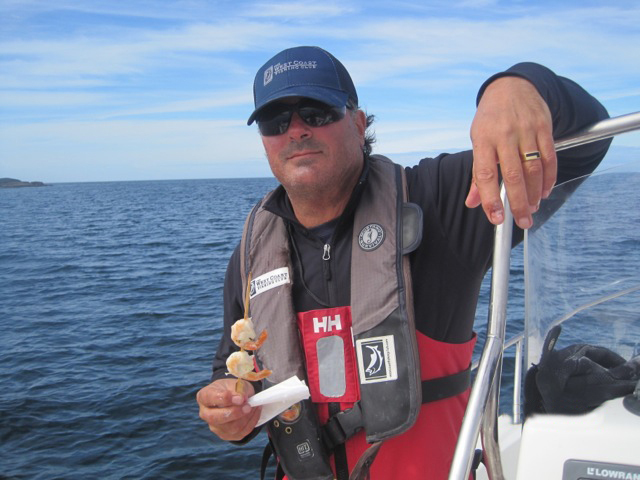 We also shook our heads at how quickly he changed leaders, cut herring, dropped lines, fixed a broken reel and kept the boat on a repeated pattern of movement over signs of life he monitored on the fish-finder, an exercise in multi-tasking that even the helicopter pilots would find dizzying. It was then and there on the sheltered waters off McPherson Point that I had to admit my selfie days were through. 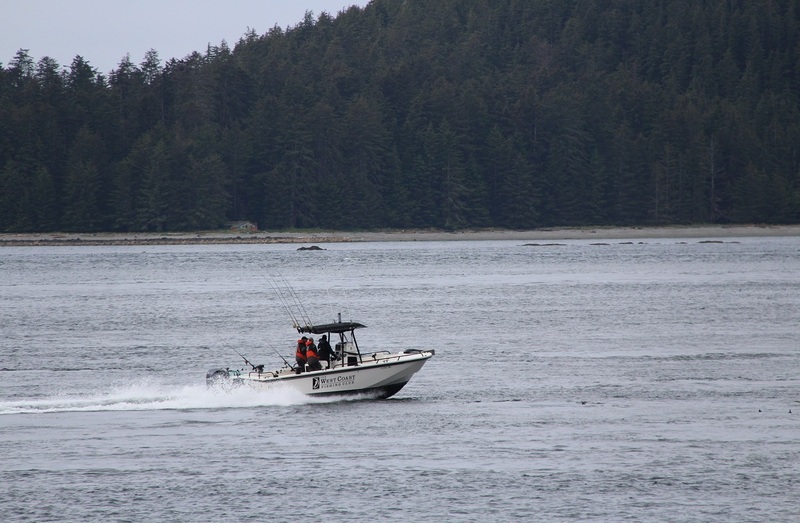 * Clubhouse boat heading out to the fishing grounds. On the bright side, the totes are yielding more fish with each passing hour. 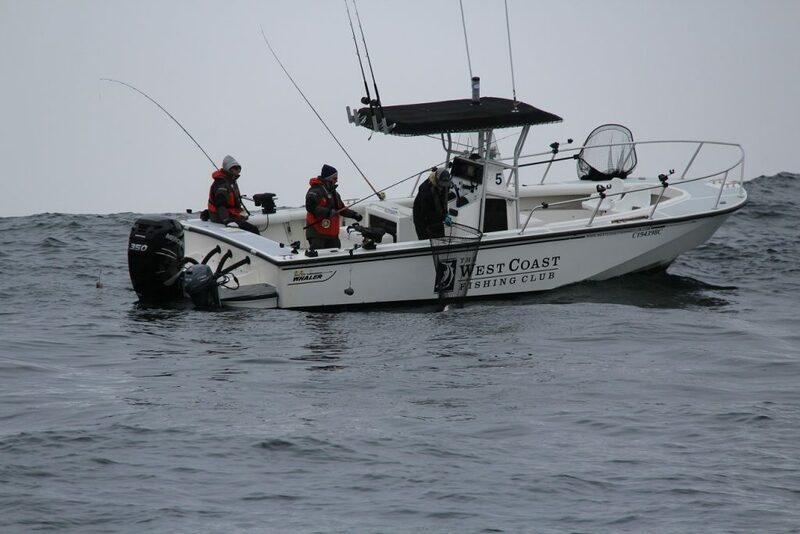 Lots of Halibut on the board too, including a pair of perfect turkey-sized slabs for Chris and me on day one after we dropped our Salmon gear down to 135 feet west of Lacy Island and got what we were looking for. 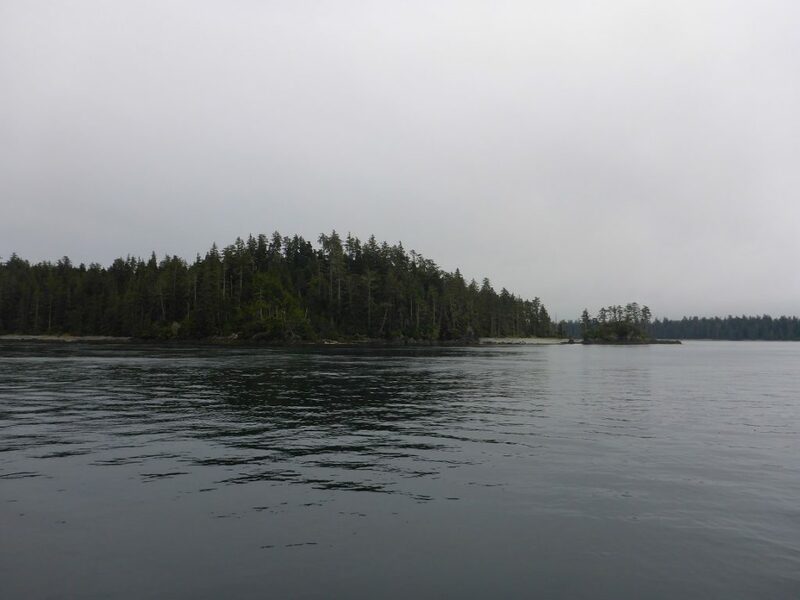 Great fun boating a decent Halibut off the ocean floor with a mooching rod, especially for Chris, who has rarely fished at all, and whose jaw was still agape over the mystic beauty of these islands from the moment the chopper touched down here at Beale Cove. 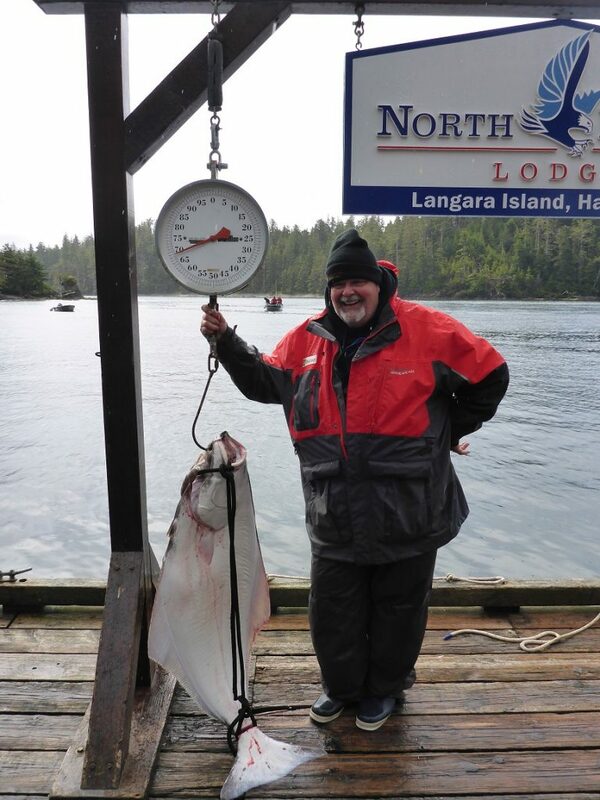 * Ted Reader with a 60lb Halibut taken on Salmon gear off Cohoe Point. 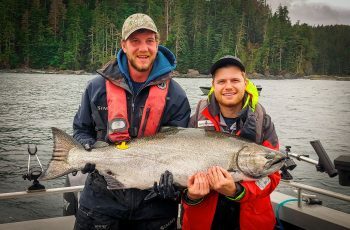 * Jerry Leonard and son Jeff Larmar – 27lb Chinook. Overall, it’s a happy group of campers here at North Island Lodge, with an even smattering of friendly folks from both sides of the Canada-US border. 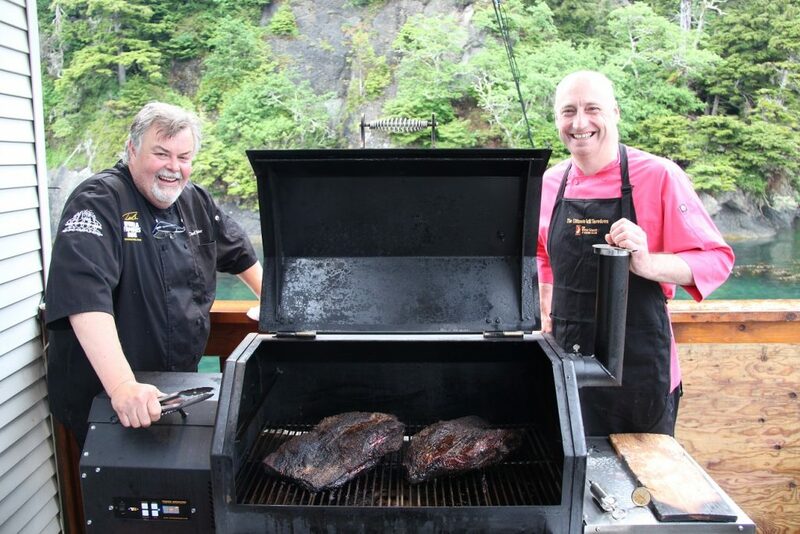 It’s also the second annual Ultimate Grill Showdown, a long sold-out barbeque extravaganza that has guests returning from their fishing shifts to deliciously fragrant smoke on the water as some of the world’s best-known pit-masters work their magic on the deck. The headliner is once again Ted Reader, Canada’s own Godfather of the Grill, who invited his transatlantic counterpart, Andy Annat, who is leading a barbeque revolution both in the UK and Europe from his home in Yorkshire. We have all dismissed any preconceived notions we may have had over barbeque fare being humble and predictable. The flavours and ingredients are as varied and eclectic as the food artists themselves, and the presentations on the plate are as colorful and sophisticated as anything we’ve ever seen. I guess that’s why these are called “special event” trips, because they truly do make an already extraordinary experience even more special. * Ted Reader & Andy Annat gather around the finished 12 hour brisket on the Yoder Smoker. 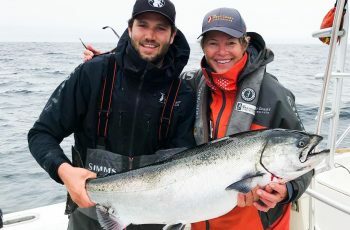 Ditto for the SNC Derby over at The Clubhouse, which is made “special” by the friendly but competitive rivalry among anglers (and their guides), not to mention the prospects of winning a return trip for two later in the season. 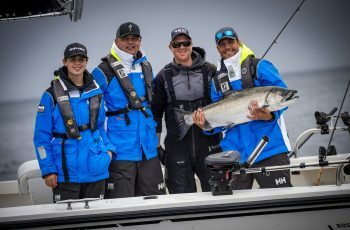 This year that prize goes to Anthony Delatolla, who nailed a fish just a scale or two under 32 pounds on day two of the tourney to clinch first place. Second Place and an Islander MR2 reel went to Norm Pitcher for his 31.25, while third-place finisher Gary West’s 31 earned him a $200 gift certificate from The Clubhouse gift shop. 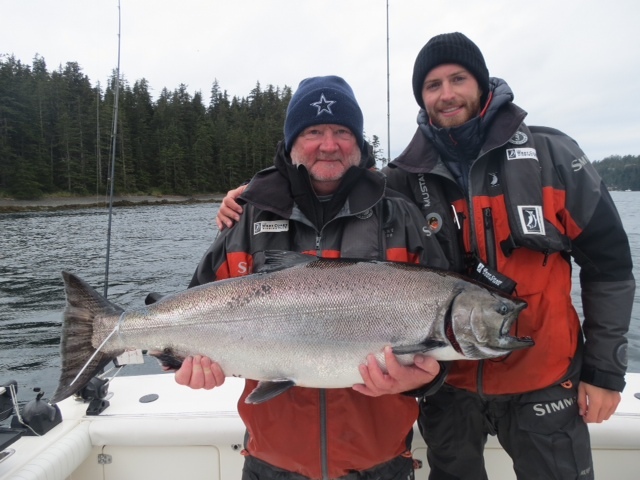 * Norm Pitcher and son Ian posing with one of the first Tyees of the season (31.25lbs). The special event schedule resumes next week when The Clubhouse plays host to its own salute to smoke in the form of the Back Deck Bourbon Barbeque. It’s the inaugural barbeque-themed event for The Clubhouse that plays on the success of the Ultimate Grill Showdown. 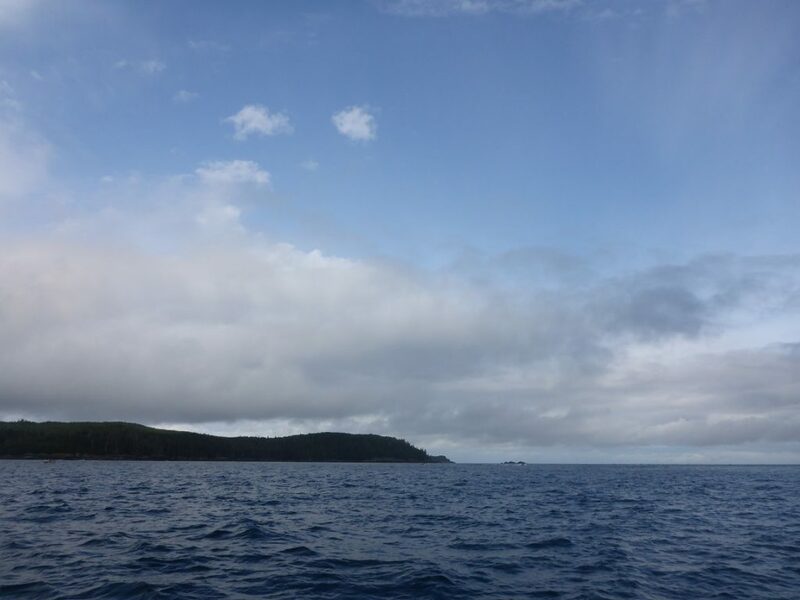 Meanwhile down at Port Louis, The Outpost is set for tomorrow’s opening day and what promises to be another spectacular season on the wild west side of Graham Island. One last thing before I go friends, and that is a shout-out to the young people who each year raise the bar even higher with respect to standards of service at all three lodges, from the first cup of coffee they pour at 5:30 am to the turn-down service at sundown. Once again they knocked it out of the park right from day one. If there were any hiccups during the set-up stage, they aren’t in evidence now. It’s as if they have been open for months. Big smiles and operational excellence in every way – way to go team! * Shannon with the seafood platter ready for our hungry guests! 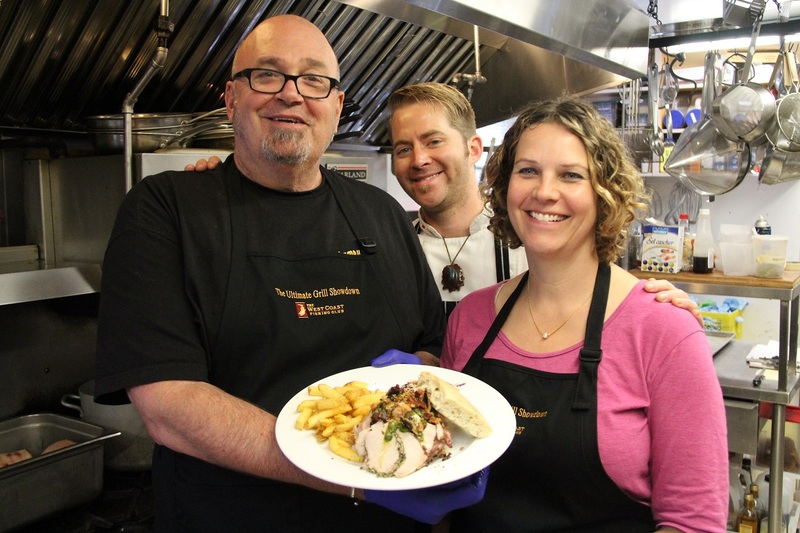 A Tyee-sized thanks also to Park and Charmaine Heffelfinger, owners of the Memphis Blues Barbeque House, whose locations are peppered throughout major centres in BC and Alberta. 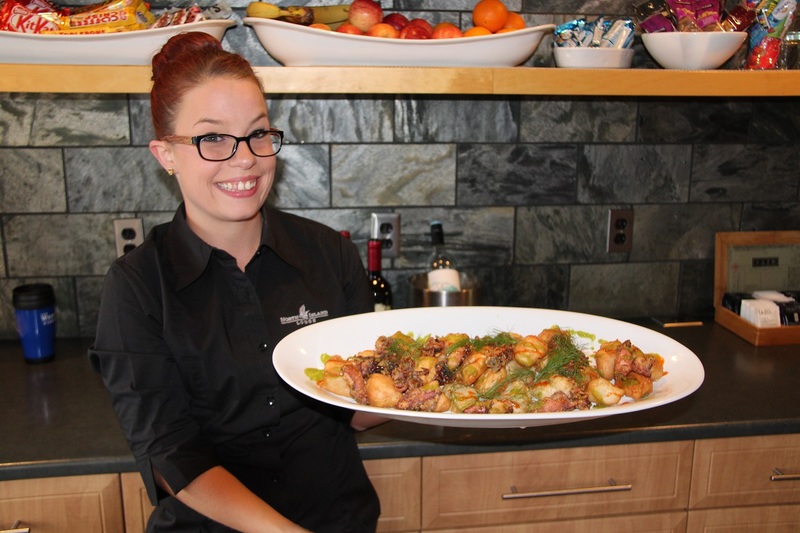 Once again Park and Charmaine have augmented the menu with their own offerings of exquisite barbeque fare, and warmed up the lodge with their most agreeable of personalities. Great people to have around the lodge and as friends. 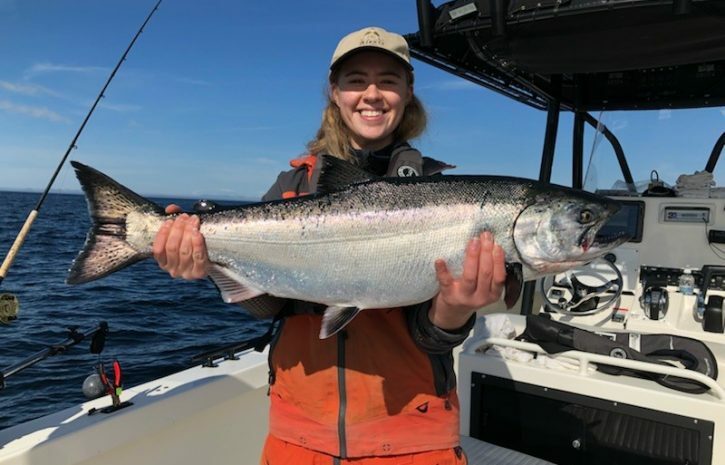 Hats off to Charmaine, who was fondly dubbed Queen of Coho last night by the gang here after she demonstrated a knack for catching these acrobatic torpedoes. But then they have Pat Davies as their guide (see above re the prudence of seeking expert advice). * Park, Liam and Charmaine with the featured lunch on Day 1 – delicious Porcetta sandwiches. * Blue sky over Mcpherson Point. 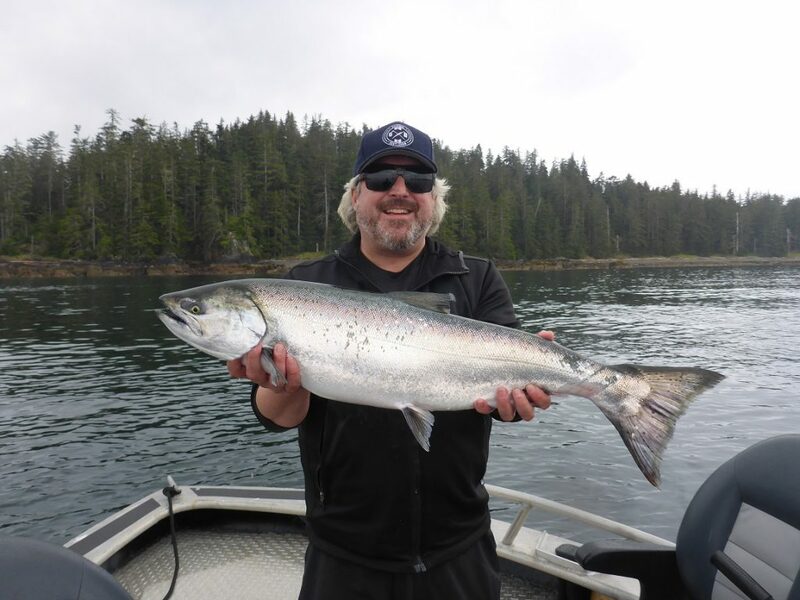 Spring – and the Spring Salmon – have again returned to Langara Island. Does life get any better than this? Until next week friends, stay safe and well. 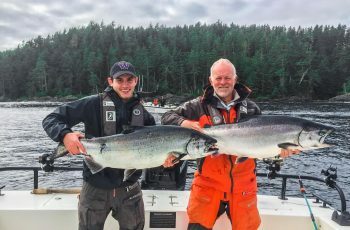 What happened to all of the 40-60 lb Tyees that used to be caught in early June? Every year they seem to get smaller and smaller in size and number. Keep your eyes on the rod Jim, June has just begun! Hope to see you soon! I love reading the HUB and seeing the photos. Great reports – even honest is stating a little slowness from prior years. The three top awards being Tyees at the Club House is good news, too. Thanks Mike! Happy to hear you enjoy our fishing reports. Be sure to check back throughout the season for the most recent update. Thanks so much for those kind words Mike. At the end of the day Mother Nature is always in charge, so we’ll always keep it honest and real. Looking forward to welcoming you back to the mystic islands.